Video game designers are notoriously obsessive gamers. But not all passionate game players are creative enough to be video game designers. Anyway, most of them can tell you what makes a game good or bad, and how to make it better. Whatever game designers are doing is working because, in 2016, the international video game industry brought in close to $100 billion dollars. The industry is only going to get bigger and stronger. Seriously, some of these game franchises have fans sleeping in lines the night before its release, only to deliriously spend almost $100 for a few hours of being lost in a world that a game designer meticulously created. What does it take to make it in this multi-billion dollar, and highly competitive industry? Put on your seat belt; this is going to be a bumpy ride (okay, not a video game reference but still). Find a local video game design program. WHAT IS VIDEO GAME DESIGN? There is just so much involved in video game design. Art, music, coding, user experience, and the list goes on. Just from the creative side where it’s the concept: the actual storytelling along with its supporting visuals and all the other assets needed to make the game a winner. Or, the designer may just come up with this fantastic idea, and their team of one or one hundred runs with it. The video game designer(s) will create an entire world where the game will be centered. They develop the entire landscape including the structure, rules, the way the story flows, and every detail in between. Often, it’s a group process. But how large the group depends on the company. The video game industry is responsible for careers that never existed even a few years ago, and it will be equally responsible for new positions that pop up in the future. Build a world, and they will come...hopefully. Well, not necessarily. Regardless, a lot is going on in between levels. Game designers are the creatives, concocting the next blockbuster video game deep within the recesses of their brains. They have ideas, thanks to an active muse working overtime. And part of their job is to take this genius plan and develop it into a full-fledged game for the masses who will spend hours holding the controllers in their excitedly sweating little hands. Game designers are also partially responsible for coding, testing, coordinating, and sometimes developing the video games unless it’s left to the developer. So, in a nutshell, video game designers plan, create, and design all types of video games. However, their role may vary a bit depending on whether they work for a big company or one of the small Indie ones. Of course, the big places have big budgets which mean larger teams. Smaller companies, well, you get the idea. And, as the video game industry gets more advanced it makes room for more specialized, yet to be described careers. It’s not so easy to break into the video game design industry, it just so happens to be a bit (a lot) on the oversaturated side, with not as many positions opening as bodies are looking to fill said positions. Although, with Indie being a ‘thing,' which is far more mainstream that it had been a few years ago, it’s feasible to consider starting your own company. With all that being said, there are certain personality traits necessary to being successful in the industry no matter how big or small the company is. Creative: This is one of those ‘duh’ moments, right? Video game designers obviously need to have more than one creative juice flowing through their body; they need to be full of it. Because, here’s the duh. You’re in the process of turning an idea into a full-fledged video game world. Passion: To be an asset to a game developing team, you have to have a passion for not only actual video games but for the entire creative process behind it, as well. Not to mention, the more you love your job, the more motivated you are to perform exceptionally well on all levels required from you...and beyond. Problem solving skills: Problems arise on a daily basis. For everyone, not just video game designers. It’s how you can solve them that’s critical for the quality you’ll bring to the workplace. Trouble Maker: This one sounds way worse than it actually is. Games are riddled with difficulties; it’s why the players get so involved in them. You not only have to be good at problem-solving, but you also need to know how to create all sorts of trouble for the best possible user experience. 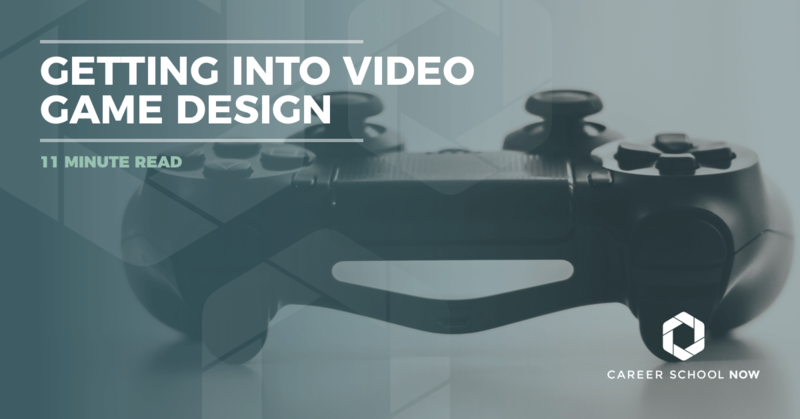 If designing video games is your passion, then yes, it’s a great career. Can you even think of a perfect position if you love creating the vision behind video games? And, what an incredible gig it is to get paid for something you’re passionate about! Right there, that’s what makes it worthwhile, despite all the blood, sweat, and tears that will be involved. It’s not an easy job, but if you love it, then it will probably make you a euphoric gamer person. Not to mention, you’ll be surrounded by like-minded people every single day. How awesome, right? Imagine getting to talk about and play video games all day, every day! Another thing about working in the gaming industry is that it’s constantly evolving and growing. And wow, is it ever growing. So, what you’re doing today may not look the same tomorrow. Who knows, you could come up with something groundbreaking in video game design that will immortalize you. Real talk here. Get a degree, whether it’s an associate’s, bachelor’s, or beyond. Look into Computer Science, or Computer Engineering, or Computer Programming because you can fall back on these. You see, you don’t necessarily need a degree in game design for a career as a game designer, although some studios do look for degreed folk. The reality is, you mostly need the appropriate skill set and a killer portfolio. However, you should consider getting a degree “in the event of.” And, since we’re being real, you never know who you’ll connect with in college, or who they’ll hook you up with in your internship, so it’s not a bad idea to go to college anyway. Sometimes, schools with a more creative discipline have important connections they are apt to put their students in touch with. So, while it’s not 100% necessary, a college could help in the long run in many ways. Again, it’s not the most important factor when heading into video game design. Keep in mind; it’s not as easy to get a video game design job as the Internet might make it look. Sure, it happens. But, as it’s already been mentioned, this is an extremely oversaturated market with more hopefuls going in than leaving. Taking game design-related college courses. Starting your own company or getting a job in one. Much like any other portfolio for creatives, make sure include the best of your best work. Prove that you’ve been hard at work making games. And, provide a way to allow the hiring personnel to play your games. They might look great on your design doc, but it’s much more impactful if these games can be played. Even if it’s a board game! Be able to explain your experiences and thought process behind all your games. Your design docs are important, and you need to know how to write them. But, you’ll need to show how that design worked as a finished product (if, in fact, it did). Keep the layout of your portfolio simple. Honestly, potential employers are only going to give it about a 30-second look-over. So, the simpler, impactful, and informative it is, the better. Game designers and game developers need each other. One drives, the other steers. If we were talking about driving a car. But, with video games, the designers come up with the idea and the developer, well, they develop it. Sometimes, it’s an all-in-one deal; the designer is also the developer. But, if it’s not, then the two go together like peanut butter and chocolate. Game design, while it’s a career in and of itself, also is the umbrella to other specialty careers in design. Animator: The animator creates the movement and behavior of all the elements of the video game. Animators earn around $75K annually. Assistant Producer: There’s a delivery deadline, and it’s the assistant producer who keeps the production team on track toward that date. Their median salary $52K. Creative Director: How the game looks and feels is all based on direction given by the creative director. DevOps: The whole infrastructure of the game is brought to you by the DevOps team, they are the ones who try their hardest to make certain games won’t crash. Game Artist: All the visuals going on in the game is developed by the game artist, from the way the characters look, to the clothing on their back, and all the other elements within the game. Level Editor: Level editors develop the landscape of each level of the game, from the buildings to every object you’ll see as the game player. Copywriter: The writers behind the script are the games copywriters. They create the character dialogue that moves the story behind the video game. Tester: Does the beta testing in hopes of debugging, deglitching, and putting out the highest quality, most refined version of the game possible. Also known as quality control. Unreal Engine: This powerful platform not only allows a team to create games, but it also houses learning videos to teach beginners the ‘how to’s’ of this platform. MAYA: On-demand learning videos, combined with a powerful designing platform. Cocos2d-x: Cocos2d-x is an open-source game development tool. Unity: A full service platform to create, and monetize your games. Gamemaker Studio By YoYo Games: Make 2D games using the drag and drop method that’s perfect even for beginners. Eclipse: Another open source tool for collaborative projects. Flambe: HTML, Flash, iOS, and Android games can be created here. Buildbox: You don’t code? No problem, you can still make video games for devices. GameSalad: Create games for devices that are fully supported by most app stores. Inform: If you like making interactive fiction games, this is the platform for you. Construct 2: Build 2D games with no coding! As far as salaries go, starting out game designers earn an average of $40,000 annually. As you grow into your senior designer position, you’re poised to make over $ 100,000 per year. Some ninjas in the world of video game design have reportedly earned much more than that, though. There are factors involved that will have an impact on your salary, such as working in a large company, or more of an Indie one. Some say having a degree versus not having one can also affect your salary, but that’s something that is still up for debate. Also, your geographic location will have an impact on what you earn. The Bureau of Labor Statistics reports a 10 percent growth through 2026 for multimedia artists and animators. This is considered above average, but with only around 7,700 jobs that are predicted to open, it realistically looks much slower than average. However, this number does not account for new game design/development companies that are destined to pop up so do not be discouraged.